Summer is coming to an early close for Las Vegas valley students. Back-to-school ads fill the airwaves, while anticipation fills the thoughts of eager minds ready to begin a new school year. As I write this, Chopin’s Nocturne Op. 9 No. 2 fills my ears with relaxing melodies steadily soothing my mind. I am often asked by friends and teachers for advice on how to help children increase focus both in the classroom and at home. No matter what your age, these easy-to-implement natural solutions help support increased concentration, mental clarity, and alertness when you need it most. Renowned as one of the most prized and precious essential oils, Frankincense promotes feelings of peace, relaxation, satisfaction, and overall wellness when inhaled or diffused. In addition to its notoriety in the New Testament, the Babylonians and Assyrians would burn Frankincense in religious ceremonies and the ancient Egyptians used Frankincense resin for everything from perfume to salves for soothing skin. I love using this highly aromatic essential oil sourced from Somalia because of its inherent ability to awaken feelings of enlightenment, wisdom, discernment, and a connection to the truth. Rich in sesquiterpenes, this oil has the ability to pass the blood-brain barrier for almost instantaneous transformative effects. Simply inhale from the bottle, or rub a few drops of this comforting oil directly on your temples or behind the neck for direct access to your brain. The peppermint plant is a hybrid of watermint and spearmint and was described by Carl Linneaus in 1753. A high menthol content—like that found in the dōTERRA Peppermint essential oil—distinguishes the best quality Peppermint from other products. Diffuse with Wild Orange during homework / home study. Use during test preparation to promote alertness and active learning. Take internally to help reduce nervous tension and occasional fatigue. use aromatically to support increase memory function. In Tune is a proprietary blend of essential oils carefully selected for their ability to enhance and sustain a sense of focus. No matter your age, staying focused on the task at hand is sometimes difficult. This is especially critical during the formative years when learning and growing create habits and a foundation for life. 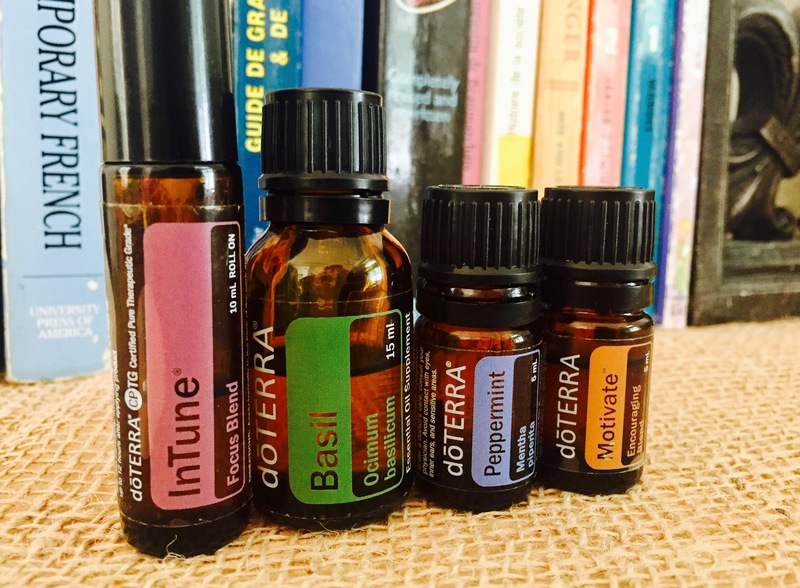 The carefully selected essential oils in doTERRA’s In Tune Focus Blend work together, supporting efforts of those who have difficulty paying attention and staying on task. Sandalwood, Frankincense, and Lime promote a sense of clarity, while the benefits of Patchouli, Ylang Ylang, and Roman Chamomile are calming and soothing. The pleasing aroma of In Tune makes this essential oil blend an easy and delightful one to use. Use In Tune at work to stay on task or when feeling tired mid-afternoon. Dispense In Tune on a clay pendant and place on a desk or in other key areas in a classroom. CHEERS! to a GREAT start of a new school year for students, teachers, and parents! Jennifer Miller is a Las Vegas based writer, doTERRA wellness advocate, and business coach for global NGO BeadforLife. Her passions include: Serving people, Inspiring ideas, and Living your purpose. For more inspiration on beginning your essential oil journey, click here.